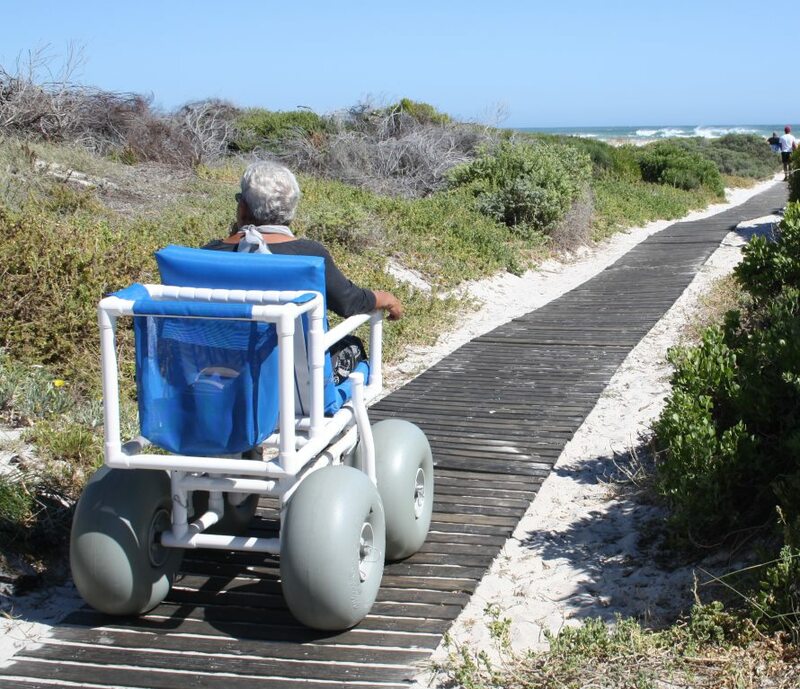 As part of their commitment to the environment and community the Southern African Vinyls Association (SAVA) recently donated an imported beach wheelchair, made from PVC pipes, to Cross Home Care based in the Gansbaai area, Western Cape. According to Delanie Bezuidenhout, CEO of SAVA, the wheelchair was imported from the USA and is the first of its kind in South Africa. It is made of medical grade PVC, has non-corrosive plastic bearings and high flotation heavy duty wheels, which allows the physically disabled to access the water and provides better mobility over unpaved areas. “Physically disabled people find it quite challenging to move around on the beach – never mind reaching the water. They are usually confined to the paved areas around the beach. This PVC beach wheelchair has the ability to take them all the way to the breakwater and makes it possible for them to spend a day on the beach with friends and family,” Delanie says. The balloon flotation tyres allow for stability and easy rolling. Because it is made with a high-quality UV protected PVC frame, it can even be taken right into the salty sea water. It won’t chip, peel, rust, fade or discolour and can carry a weight of 115kg. The PVC beach wheelchair was handed over to Sister Tertia Scholtz who owns Overberg based Cross Home Care, runs various community projects and offers free emergency assistance to both residents and visitors to the Pearly Beach Resort. Commenting on what the donation will mean for the local community, Sister Scholtz said: “We have many community members who are wheelchair bound. 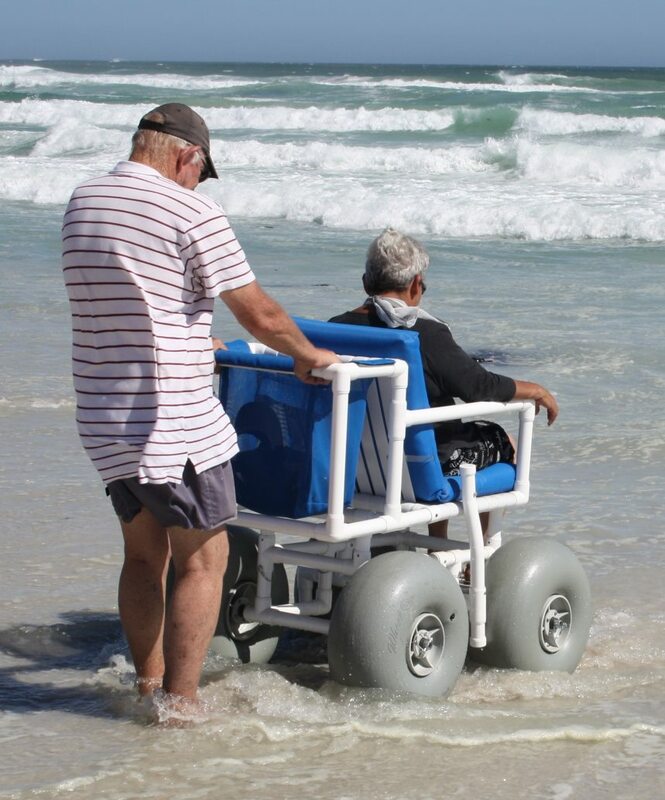 Thanks to this novel beach wheelchair, we will now be able to allow them to experience the joy of experiencing the beach and the ocean. The use of the PVC beach wheelchair will be free of charge and we would like to invite anyone who is interested in using the beach wheelchair to contact me and book the PVC beach wheelchair for themselves or a loved one, for their next beach adventure”. “PVC is extremely versatile and used for a wide range of everyday applications, ranging from water pipes to floors, shoes and medical equipment. PVC is safe to use and extremely durable. We hope that the PVC beach wheelchair will contribute to building many happy, new memories and experiences for the physically disabled! We would be happy to assist local residents and organisations who might be interested in purchasing a similar beach wheelchair for their own use,” Delanie concluded. PVC is a potent toxin and carcinogen with a 50,000 year life to breakdown. It begins vaporizing at 200*F and combusts at 400*F into vapor that one pound can kill 400 200 pound humans outright in 15 seconds of breathing it, or cause over 1,000 cases of cancer, mostly incurable liver cancer. It should not be manufactured at all and the existing PVC is enough to kill everyone on Earth over 1,000 times. It may look like a good idea but is not, and is supported and covered up by the huge greedy petro-chemical industry.